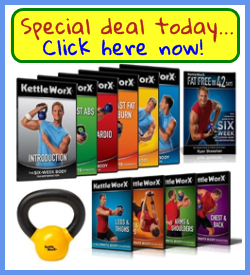 Kettlenetics is a totally unique, dance inspired exercise program that uses the kBell to swing, slim and sculpt your entire body strong and slender. The easy flowing moves are set to incredible, upbeat music, for fast, fun, total body slimming. With easy, flowing moves set to upbeat music, Kettlenetics is a fun and fast way to develop a stronger and more slender body. This revolutionary three-dimensional weight-swinging workout has all the fat-burning, muscle-shaping benefits of resistance training but without the awkward, heavy weights of traditional weight lifting. Michelle Khai is a lifelong fitness advocate, former professional dancer, and all-star celebrity trainer. Michelle has been working with world-class ballet dancers from the NYC Ballet and Miami City Ballet for years, creating custom body-slimming kettlebell workouts to help the dancers strengthen and tone muscles while staying sleek and slender. Having discovered the “swing secrets” to quickly slimming and toning dancers’ bodies, Michelle decided to create an all-new kettlebell workout: Kettlenetics Slim and Tone — that would create amazing results for women everywhere. Unable to find a kettlebell that would work with her program, Michelle set about creating her very own kBell that is light enough for graceful fluid movement and heavy enough for fast, body-sculpting results. The uniquely designed four-pound Kettlenetics kBell is curved, sleek, and fits easily in your hand for smooth 360-degree full body-slimming movements. The kBell has an offset, sure-grip handle to better maneuver through creator Michelle Khai’s innovative flow Motion movement patterns. Weighing just four pounds, the kBell is light enough to swing without undue stress, yet heavy enough to provide body-shaping resistance. 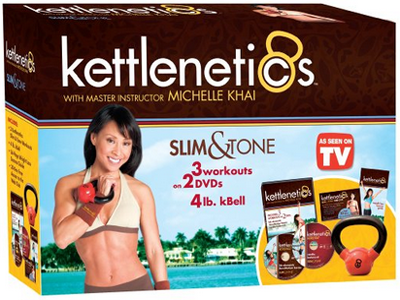 The Kettlenetics Slim and Tone Kit includes three Kettlenetics Slim and Tone Workouts on one DVD. The first two 20-minute workouts teach you the Kettlenetics basics. 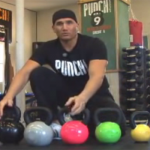 KB Elements teaches everything you need to know to get the most from your kBell. FlowMotion Basics gives you 360-degree body sculpting workout with unique standing and floor exercises. The 40-minute Cardio Balanced workout is a powerful fat burner that takes the kBell workout to the next level. I ordered this from the kettlenetics website and had no problems. This workout is amazing. I could see results within my first week of training. 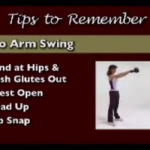 It particularly increases strength of your grip, shoulders, thighs, and especially core strength. The workout can be done at several levels of difficulty, so you can progress as you get stronger. I love kettlenetics! I finished my 3rd workout this week and already seeing visible results. My abs, thighs, lower back and all over body is losing fat. 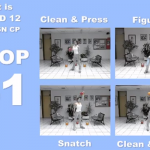 The DVD’s are fun to do and doesn’t seem like your working out. Being a student, I can’t afford a gym membership so this is a great alternative for me. I can workout anytime in the privacy of my own home. I sweat as if though I worked out on the treadmill running for 3 miles. I have been searching for a workout that will give me the effective results that I’ve been looking for and that doesn’t take a lot of time to do. Kettlenetics is fun and addictive. I can fit in jeans that I haven’t been able to get into for over 3 years now!